ON THIS DATE (June 2, 1995) ... It was still 19 days until summer, but on this early June night with Fenway Park packed, beach balls fluttering in the bleachers, the popping noise of a Roger Clemens fastball and a six-game lead in the American League East, the Boys of Pre-Summer made it a sweet summer baseball night in Boston. 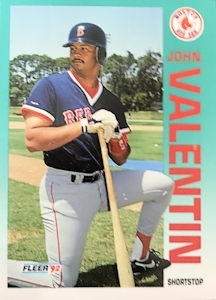 And it's one John Valentin -- 5 for 5 with three solo homers and 15 total bases -- will never forget. It probably will be frozen in Red Sox folklore. The last time a player had more than 15 total bases was Fred Lynn, whose 16 against the Detroit Tigers in 1975 tied an American League record. It was Valentin who began the winning rally when the emerging star (fitting nicely as the Rico Petrocelli of the '90s), doubled to start the 10th off Salomon Torres. After an intentional walk to Mo Vaughn and a botched sacrifice bunt by pinch hitter Steve Rodriguez, Mike Greenwell brought the house down with an opposite-field single to left that scored Vaughn with the winning run. Valentin's third home run of the game in the eighth inning, a high, towering blast that cleared the net and likely landed across Lansdowne Street, had brought the Sox to within a run. Then the hysteria continued when Mike Macfarlane smacked his eighth home run with one out in the bottom of the ninth to bring the Sox back to a 5-5 gridlock. Trailing, 5-2, there seemed little hope. There were a few boos in the crowd. But suddenly Valentin started cranking and the Sox were again impersonating the Cardiac Kids of 1967. The bullpen racked up five scoreless innings.